Next, apply a wood deck brightener to neutralize the pH level of the wood. Allow the wood to dry a few days before staining unless you are using Restore-A-Deck, which can be used the same day as the prep. Read the directions on the stain can for suggestions for the best tools to get the job done. Most deck stains and sealers can be applied using a brush, roller, stain pad, pump, or airless sprayer. The best way to apply will vary though based on the type of stain you are using. Any questions on this, please ask below with the brand and type of stain you are using. Apply the stain or sealer evenly and do not over-apply. If the stain puddles up, it means you’ve applied too much. It may leave an inconsistent shiny look on the surface that may not dry properly. If over-applied, the stain may crack, peel, and flake off, which is not only unsightly but jeopardizes the longevity of the wood. To further prevent over-application, brush back any excess stain so the surface is evenly applied. Be careful to apply only as much stain as the wood will soak up. Another common problem when applying deck stain or sealer is when there are lap marks made. Lap marks occur when you start and stop staining in the middle of a board during application. To avoid them, do not stop applying stain to a board once you have started. Do one board at a time. Move onto the next board entirely and evenly from one end to the other and always keep a wet edge from one board to the next. Continue until all the boards are finished. 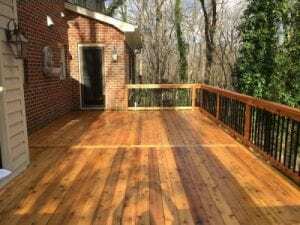 Do you have any questions about how to apply deck stain? We want to hear your thoughts. Feel free to leave us a comment below. We had a PTP deck stained with TWP 100 4 years ago. It was 1 yr old at that time and the first time to be stained. It was only washed with a garden hose to prepare and one coat applied. The person doing it was not familiar with RAD products or TWP stain and did only a fair job. We should have already done it a year or so ago but we just haven’t been able to find any professional familiar with the RAD or TWP products in the Birmingham, Al area. So we have decided to attempt it ourselves. We plan to used the RAD cleaner and brightener and use the TWP 100 dark oak again. We have a few concerns. We are novices at this and very limited to what we can do physically. Is it absolutely necessary to apply 2 coats wet on wet? Just wondering if we can possibly get by with one coat or at least wait to apply a second coat later. We just discovered have got to replace the handrails due to the 1×6 deck boards used previously starting to deteriorate. We plan to buy some 2×4 PTP and let them “dry out” and then cut and stain before installing them. Wondering if we could do the 2nd coat at that time. How long would the new lumber need to “dry out” before staining. It is currently still in the 80’s and 90’s most days but we didn’t know if we could afford to wait on doing the rest of the deck until after they are replaced due to it possibly getting too cold. (weather changes rapidly and fluctuates greatly this time of the year in Alabama. ) Thank you so much for your advice. I love this website. Best to do the two coats wet on wet for the older wood and one coat for the new wood. We would wait and do all in the Spring. This is with the new wood weathering exposed until then. I have a new PT deck I will be staining in the spring. It has black aluminum balusters. Do you have any tips or suggestions for staining around these without making a mess of them? I’m considering taking the railings off and removing the tubes. Is that worthwhile? When we do these decks we just stain around them with a brush and then wipe the spindles right away to remove the stain that got on them with a rag. This works well when using an oil based semi-transparent stain. And how do I prevent stain overlap with a deck that is ~60’ long, making a single board application tricky. Clean and brighten the wood after the sanding. Use the Restore A Deck Kits. Stain with Armstrong Clark in one of the 3 hardwood colors you have. Use a stain pad on a pole and move fast when applying so you do not have overlaps. Used Behr deck over a few years ago with unsatisfactory results. We are sanding and cleaning, but what kind of product can we put over top. Stripping the whole deck is not an option. Sorry, but it has to be removed fully. Nothing can go over the Behr Deckover. I applied 2 coats of Sikka SDR 1 base coat and plan to add the Sikka SDR23 next. The directions advise not to apply in the sun. Why is that? As My deck is mostly sunny, I waited to late in the afternoon to gain as much shade as possible. One area was still sunny when I applied the stain. It is drying with a grey hue over it compared to the rest of deck. Is this a result of staining in direct sun?? Could dry uneven and blotchy if in full sun and hot. Not sure about why gray. Post a picture. What is wet on wet application? And can this be done on deck stairs with expectation to use stairs that same day? And is it better to stain early morning if the day is going to be greater than 90 degrees or at night? I need to be able to use next day for a party or should I really wait before there is that much traffic? It would not be a good idea to stain it the day before a party. It may not cure fully by then and the stain may have an odor as well for a few days. I have a 30 year old pressure treated wood deck which has never been stained or treated. My brother in law lent me his power washer and I also have several containers of Olympic Oxy Deck. 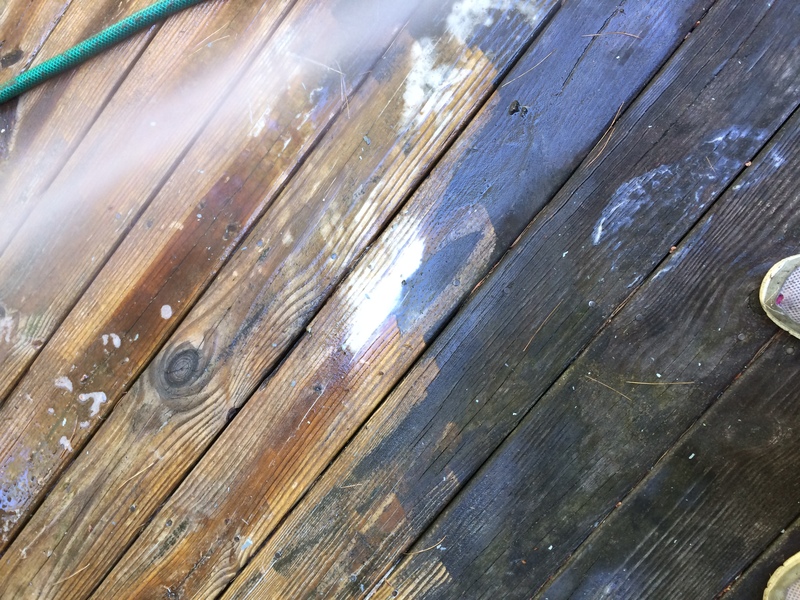 Do I first power wash the deck and then make up the wood brightener and use a roller to put it on or can I add the wood brightener to the power washer and do all at once? Olympic Oxy deck is actually a deck cleaner, not a true wood brightener. They are misleading you with the wording. It cannot be applied with a pressure washer. You apply this with a pump sprayer first and then pressure was off. Thank you for your reply. Appreciate it. Did exactly what you said olympic cleaner first leave gor 10 min. Them power wash.. Perfect! Thanks much.